The first time I stepped onto my Microdry Ultimate Luxury Memory Foam Bath Mat was an experience. This has to be the nicest, most luxurious bath mat I’ve ever owned. It beats my old threadbare bath mat by a landslide. 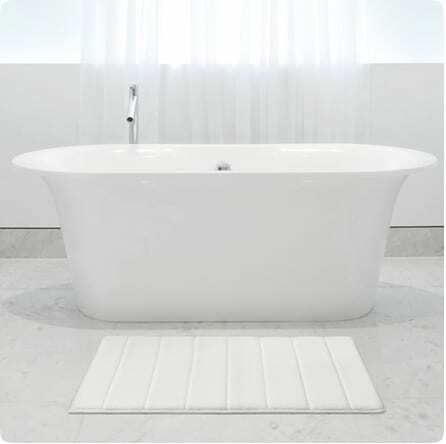 So what’s different about this best selling bath mat and how does it differ from all the other bath mats on the market? The fabric it’s made of is key. Microdry is a new fabric that absorbs water twice as fast as other materials and it actually dries 30-50% faster than other materials. My old bath mat used to stay wet for hours and hours after a bath and even longer when my daughter took a bath with all her splashing. I hated going into the bathroom with sock feet later on and getting my feet wet. Plus wet bath mats tend to smell. The MicroDry Ultimate Memory Foam Bath Mat really does dry quick and eliminates getting wet feet when you visit the bathroom after someone has had a shower or a bath. However, my favourite feature is actually how GOOD it feels on my feet when I step out fo the shower. It’s incredibly soft so that your feet sink into it. It’s also fits in well with my decor and is pleasant on the eyes. You can find these mats in a variety of colours including Dark Chocolate, White, Ivory, Blue, Ebony, Deep Linen, Thyme, Iris, Red, Dark Green, Medium Blue, and Grey. John and I are going to renovating both bathrooms eventually and this is the bath mat I want. I just need to figure out which colour I’m doing the bathrooms! You can find the entire MicroDry collection at Bed Bath & Beyond stores or the online site. Connect with Microdry on Facebook. I have this bath mat. It feels so good on my feet because it is so soft. I also like how it does absorb water. I have the cream-colored one. It tends to show every bit of dirt, fluff, and hair. Wish we had a darker color. I do wash it in my washing machine. Washes great. What setting do you clean your mat on? Can it go in the dryer, too? I saw memory foam bath mats for the first time yesterday. I definitely want one (or five). They feel fabulous! Just got 2 mats, contour mat and runner last night. We showered and the mats we stepped on absorbed quickly but 15 hours later (now) they are still soaking wet and freezing cold.. Im not impressed at all. Overpaid for bath mats that do not dry.